Foley had his last radiation treatment a week ago Friday, and he's feeling better and better. 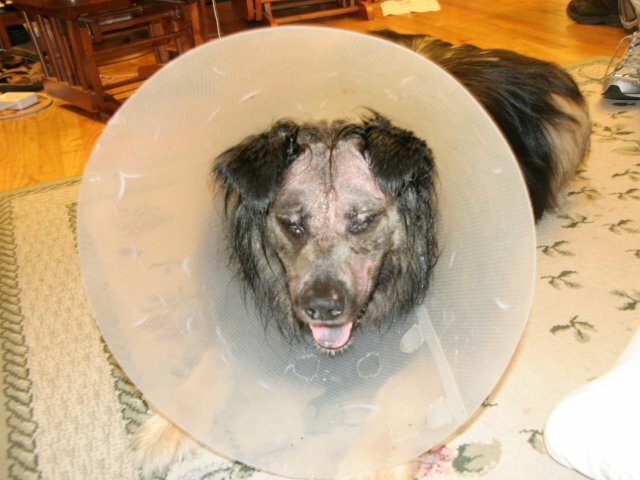 The side effects of the radiation continue to grow for about a week after the treatments stop; we had been warned (and shown pictures) of other dogs who have undergone this course, and they lost all their skin, which grew back after a week. Foley seems to be fortunate in that he's dark-furred; the oncology vet tells us that such dogs tend to tolerate the radiation better than lighter-skinned dogs, and so his skin got red (almost cherry-red in places), but it never peeled completely off. This is good, because I gross out easily. As you can see above, he's still a little pink in places, but it's not much different from how he looked on Friday. He's now covered over the entire top of his head (except for those parts where he can get to with his tongue, i.e., near his mouth) with silvadine cream, an ointment used for burn victims*. This seems to be principally some kind of petroleum jelly, which gives the remaining fur near his face a greasy, stringy appearance. The X-rays shut down his tear ducts, and while we had been warned about this, we forgot to ask the radiologist for appropriate prescriptions to prevent side effects. Naturally, the first time we saw those side effects — which include ulceration of the eye — was during the weekend following the 4th of July. Our radiologist was therefore unavailable, though our regular vet was. We ended up spending the next 48 hours in shifts putting substitute tears in his eyes every 15 minutes until we could get the proper tearduct stimulant prescribed on the following Monday. In addition to the stimulant, he's on an eye lubricant and an antibiotic. So far, it looks like he'll be able to keep both eyes, though he'll probably be squinting through his left eye for the rest of his life. The radiation also affected the inside of his mouth, and he has a lidocaine slurry we have to squirt in there on an as-needed basis. At first we had to puree his food so he could eat it, but he's recovered now to the point he's back to his usual diet. Hannah's last radiation treatment is Thursday. As things progress, she feels less and less like going for walks, though tonight she was happy to do so. Perhaps because their treatments overlapped, and possibly because it was on the other end of the dog, it seemed to me like her radiation therapy has gone by faster. In any event, things are looking up, and both dogs are doing well for now. *He's been off the silvadine cream for about a week, the wife tells me. Rob, best of luck with the pooches. You are obviously doing everything you can do. I can certainly relate since I've got a dog with special needs after a spinal injury, but it's worth it. Ditto SB above. Despite appearances, that's one lucky dog. Ditto. Thanks for your effort to care for Man's Best Friend. This man's, anyway. We also give money to Capistrano Animal Rescue, and encourage folks to do the same.